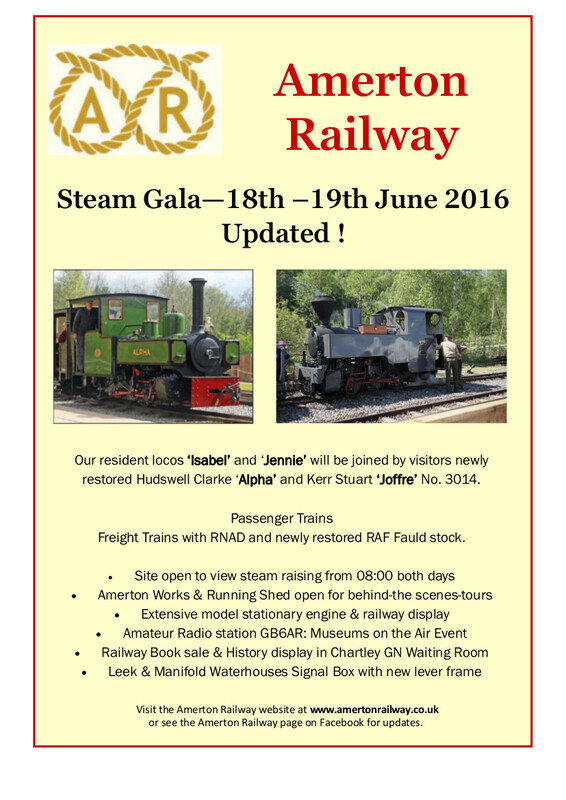 The Amerton Railway Summer Steam Gala takes place on Saturday 18th & Sunday 19th June 2016. Joining Amerton Railway resident locos “Isabel” and “Jennie” will be visitors newly restored Hudswell Clarke “Alpha” from the Statfold Barn Railway and Kerr Stuart “Joffre” no. 3014 from the Apedale Valley Light Railway. Freight trains will run in addition to regular passenger trains and will include both RNAD and newly restored RAF Fauld stock. The station yard will be open from 8:00am on both Saturday & Sunday to view preparation of the locos. The Amerton works and loco sheds will be open for behind-the-scenes tours, whilst the ex GNR Chartley waiting room will house a railway history display and sale of railway books. This is also “Museums on the Air” weekend and we will be joined by our friends from the Staffordshire Portable Amateur Radio Club operating a special event station call sign GB6AR. There will be an extensive display of model stationary engines, 16mm narrow gauge layout and an opportunity to see progress on the restoration of the ex-Leek & Manifold Valley Light Railway Waterhouses signal box.